, earl of Hardwicke, the eldest son of the preceding, was born Dec. 20, 1720. At the school of Dr. Newcome, at Hackney, he received the first rudiments of his education, and from that seminary, on 26th May, 1737, was removed to Bene’c college, Cambridge, under the tuition of the Rev. Dr. Salter. In the year following ha was appointed one of the tellers of the exchequer, in the room of sir Charles Turner, bart. deceased. In 1740 he. left college, and soon after married lady Jemima Campbel, only daughter of John lord viscount Glenorchy, by the lady Amabel Grey, eldest daughter of Henry duke -of Kent, at whose decease she succeeded to the title of marchioness Grey and baroness Lucas of Crudwell. By this marriage he became possessed of a large part of the duke’s estate, together with his seat of Wrest-house, near Silsoe, in Bedfordshire. He early engaged as a legislator. In 1741 he was chosen member for Ryegate, in Surrey, and in 1747 one of the representatives for the county of Cambridge, as he was also in 1754 and 1761. At the installation of the duke of Newcastle, as chancellor of the university of Cambridge, in 1749, he had the degree of LL.D. conferred upon him. 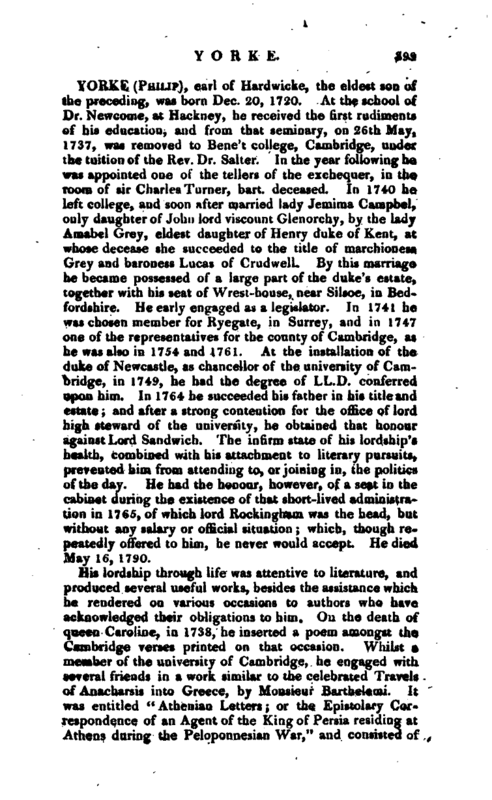 In 1764 he succeeded his father in his title and estate; and after a strong contention for the office of lord high steward of the university, he obtained that honour against Lord Sandwich. The infirm state of his lordship’s health, combined with his attachment to literary pursuits, prevented him from attending to, or joining in, the politics of the day. He had the honour, however, of a seat in the cabinet during the existence of that short-lived administration in 1765, of which lord Rockingham was the head, but without any salary or official situation which, though repeatedly offered to- him, he never would accept. He died May 16, 1790. His lordship through life was attentive to literature, and produced several useful works, besides the assistance which he rendered on various occasions to authors who have acknowledged their obligations to him. On the death of queen Caroline, in 1738, he inserted a poem amongst the Cambridge verses printed on that occasion. Whilst a member of the university of Cambridge, he engaged with several friends in a work similar to the celebrated Travels of Anacharsis into Greece, by Monsieur Barthelemi. It was entitled “Athenian Letters; or the Epistolary Correspondence of an Agent of the Kin r of Persia residing at Athens during the Peloponnesian War,” and consisted of | letters supposed to have been written by contemporaries of Socrates, Pericles, and Plato. A few copies were printed in 1741 by Bettenbam, and in 1782 a hundred copies were reprinted; but still the work was unknown to the public at large. 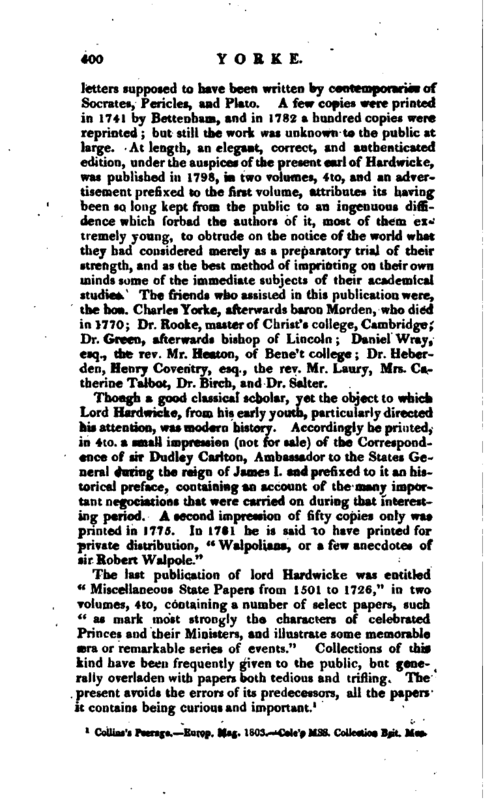 At length, an elegant, correct, and authenticated edition, under the auspices of the present earl of Hardwicke, was published in 1798, in two volumes, 4to, and an advertisement prefixed to the first volume, attributes its having been so long kept from the public to an ingenuous diffidence which forbad the authors of it, most of them extremely young, to obtrude on the notice of the world what they had considered merely as a preparatory trial of their strength, and as the best method of imprinting on their own minds some of the immediate subjects of their academical studies. 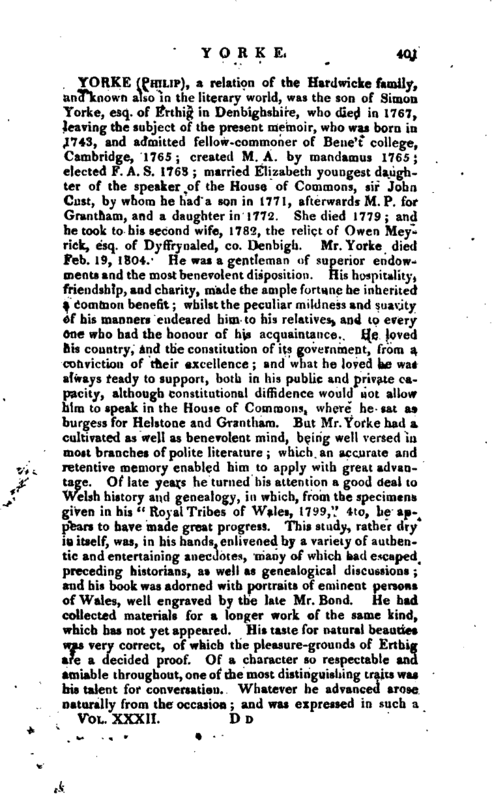 The friends who assisted in this publication were, the hon. Charles Yorke, afterwards baron Morden, who died in 1770; Dr. Rooke, master of Christ’s college, Cambridge; Dr. Green, afterwards bishop of Lincoln; Daniel Wray, esq., the rev. Mr. Heaton, of Bene’t college; Dr. Heberden, Henry Coventry, esq., the rev. Mr. Laury, Mrs. Catherine Talbot, Dr. Birch, and Dr. Salter. Collins’s Peerage. Europ. Mag. 1803. Cole’s Mss. Collection Brit. Mus.